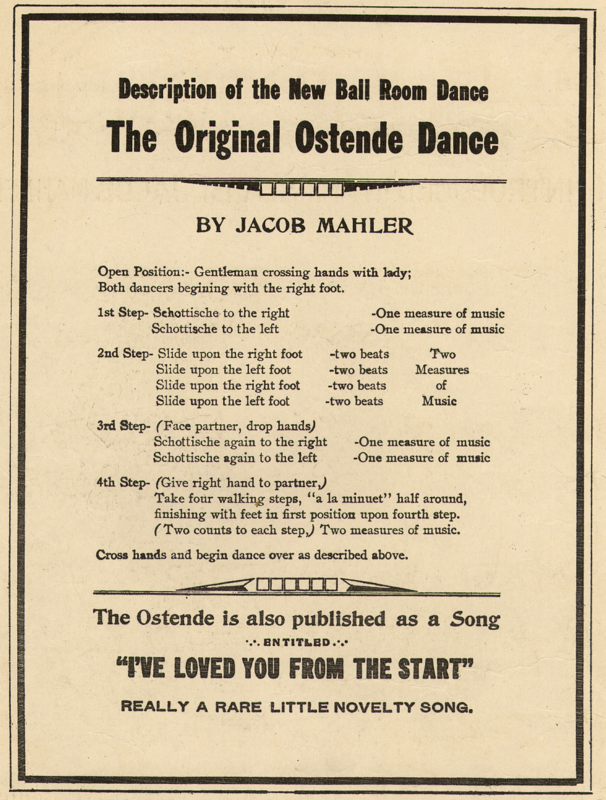 The evolution from the Skaters Schottische to the Salty Dog Rag is a great example of how dances change over time. As described in M. B. Gilbert's Round Dancing. Position: Double Skaters' Position, with hands crossed behind, left hands held behind his back, right hands held at Follow's right hip. 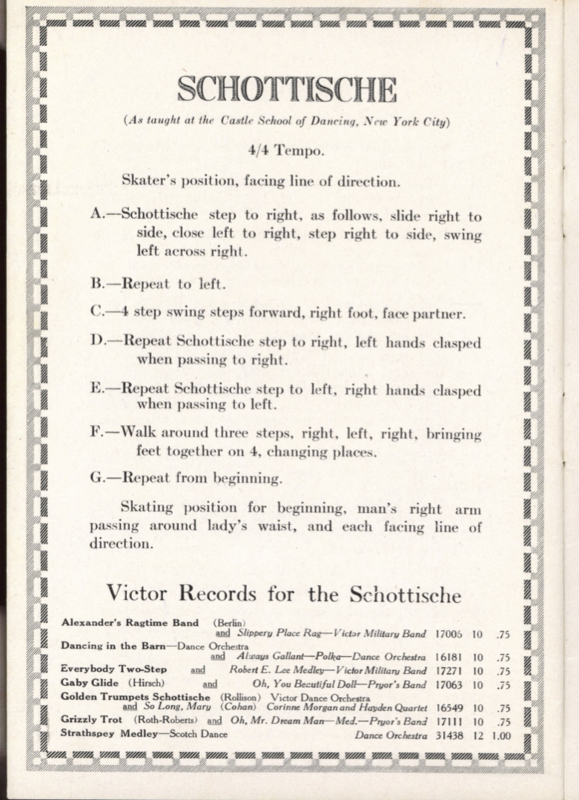 A) Both starting with the right foot, schottische (slide-close-slide-hop) diagonally forward to the right "in the imitation of skating." Then schottische diagonally forward to the left with the left foot. B) Four step-hops straight forward, raising the free foot slightly in front on the hops. 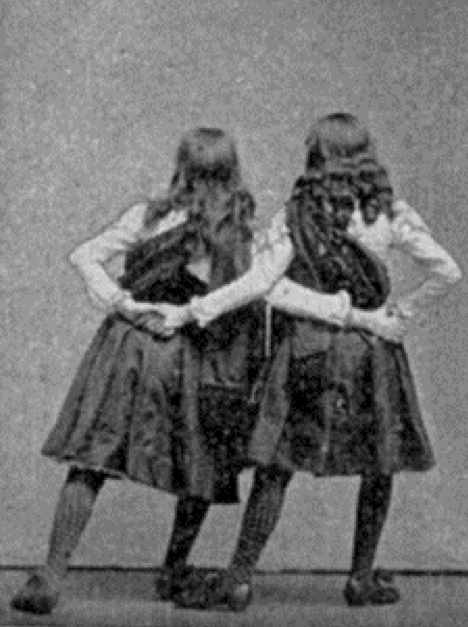 As danced at Bournique's School of Dancing in Chicago. Position: Hands crossed in front. Same as the Skaters Schottische. As a variation, the Lead can sweep the Follow across to his other side on the step-hops. As described by Jacob Mahler. A) Same as the Skaters Schottische, but smooth, with no hops. B) Four slow gliding steps forward, with no hops. C) Turn to face partner, drop hands, and schottische to the right away from partner. Then schottische to the left toward (and slightly past) partner. D) Taking right hands, both walk forward with four slow walking steps to turn 3/4 clockwise around each other, facing LOD and taking crossed hands at the end to repeat. 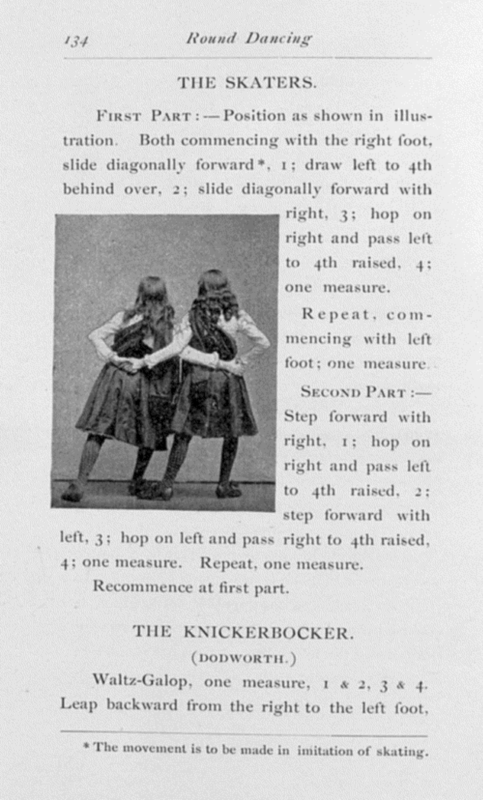 Originally known as "The Schottische, as taught at the Castle School of Dancing." As taught by Vernon and Irene Castle. Position: Skaters' Position, with right hands behind Follow's right hip, left hands in front of Lead. A) Same as the Ostende, but swinging free foot across in front on the fourth count into the next step. B) Same as the Ostende, but swinging free foot in front into each step. C) Similar to the Ostende, but keep left hands for the schottische to the right. D) Taking right hands, both walk forward to cross into each other's places with three slow walking steps. On fourth count, bring feet together without weight, taking Reverse Skaters Position (Follow on the left). Repeat from the beginning in this new position, starting left feet. As danced to the Red Foley song of the same title. Version 1: The same as the Ostende, but taking left hands for the slide away to right as in the Castle Schottische, and doubling each part, AABB. Version 2: Similar to Version 1, but adding a free spin to the second half of Part C, pivoting to the left on the left-footed schottische, passing to the left of your partner. Clap on count 8, then take right hands to turn around each other, with left jazz hands. Version 3: Similar to Version 2, but substituting another footwork pattern—there are several possibilities—for the schottisches in Part A the second time through. Thanks to Richard Powers for conducting the first version of this evolutionary analysis.